It’s not what you’d expect — a young man campaigning for fewer nightclubs in the glitter strip of Surfers Paradise — but teenager Alex O’Donnell wants to close some of them down. Mr O’Donnell (pictured left) says nightclubs cause too much anti-social behaviour. He is standing for election to the Gold Coast City Council with a plan to reduce the number of nightclubs to help curb late night hooliganism – usually committed by males of his age group. Enforcing laws against serving intoxicated nightclub patrons, education in schools, and encouraging wider use of the Orchid Avenue chill-out zone would also help, he said. “Young people need to be taught how to respect themselves and the laid-back attitude to drugs and alcohol has to change,” he said. At 18 Mr O’Donnell is the youngest of the 60 candidates running for election in the Coast’s 14 electoral Divisions. 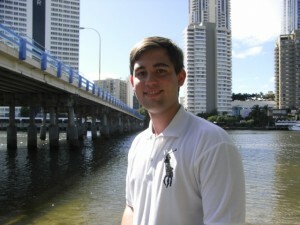 A second-year law and government student at Griffith University, he’s put his studies on hold to devote himself full-time time to campaigning. He said politics is the reason he gets up in the morning and if he could have stood for election 10 years ago he would have. The council division for which he is running (division 7) includes the suburbs of Surfers Paradise, Main Beach, Isle of Capri, Benowa, Bundall and parts of Southport and Ashmore. The division has the oldest population on the Gold Coast, but Mr O’Donnell doesn’t see his youth as an issue. A self-styled conservative, Mr O’Donnell nevertheless is a staunch republican rather than a monarchist. He believes every Australian should have the right to aspire to be head of state. I’ll give him credit for having the idea to reduce the number of night clubs… but tell him he is dreaming! Personally I stopped going to nightclubs years ago and I’m only 25. Closing nightclubs in the gold coast, particularly surfers paradise, will not curb the violence or intoxication of young adults but only push it to somewhere else. I’d rather have all the “drunken street monkeys” party hard inside a nightclub close to a police beat than to have them cause trouble in more nice places like broadbeach. Mr O’Donnell is only 18 and has no life experience or is any position to make any judgements on nightclubs… he’s probably only been there once… or even probably not at all by the sounds of it. Sure people will probably listen but not going to take him seriously! Finish your degree mate, go out and have some fun, get some life experience then try again! You won’t be getting my vote! I’ll vote for anyone who will get rid of that riduculous tram (masquerading as a rapid transit system). I love the Gold Coast and Surfers in particular. That piece of 1890’s “technology” will kill this great city and should be aborted at any cost.